Editor’s Note: You may have noticed that for the past few years we haven’t been running the local gift guide. Sadly, after a few years of gift guides we couldn’t find enough local makers and new shops in Green Lake for a full guide. Instead, we received a ton of pitches from national reps trying to sell their stuff to us. But we received an email recently from a local shopowner that is doing some pretty cool things and is opening right before the holidays. So consider this your unofficial gift guide for the outdoorsy person in your life. Seattle Greenlaker: Tell us more about why you decided to open the store? Ben: Nate and I are both avid outdoors-folks. We’ve both lived in different parts of the country and found that, in small outdoorsy towns and big outdoorsy cities alike, used gear shops were a common and popular part of the community. I moved to Seattle about 5 years ago and was surprised that a shop like this didn’t already exist. When Nate moved here two years ago, we began talking about what it would take to start something in Seattle, and then spent 6 months researching and planning before finding a place to set up shop. Seattle Greenlaker: Why now and why in Ballard? Ben: Outdoor recreation equipment/clothing is expensive, and we wanted to create a place that made adventuring outside more affordable and inclusive. For folks who have gear they’re no longer using, we wanted to create a place that was easy, convenient, and appropriately incentivized to consign their gear. We believe strongly in keeping useable gear in the wild and out of the landfill. We found a great location and landlord in Crown Hill/North Ballard. While the building will eventually be converted into apartments, the opportunity to try the business in this neighborhood was too good of an opportunity to pass up. Seattle Greenlaker: How does it work from a consigner/seller’s side of things? Ben: We want to make it really easy for people to consign their gear. Folks can bring in their items any time we’re open to set up an account and drop their things off. No appointments! Everyone is given an online portal to view the status of their gear. Once something sells, the consignor receives a percentage of the sale. Our payout tiers can be found here. Consignors can then be paid by check or PayPal. If they want to use their balance for in-store credit, they receive an additional 10%. Seattle Greenlaker: Do you offer gift cards? Seattle Greenlaker: Anything else you’d like to share about your store? Ben: We have worked really hard to keep the ethos of reuse and recycle in every part of our business. Nearly all of the racks and fixtures of our store were saved from businesses that were moving or closing, or we built them ourselves using materials the previous tenant left in the building. Even our phones and computer are refurbished or saved from an office that upgraded. Whether it’s starting a business or tackling a backcountry objective, we have a strong conviction that the newest/latest/greatest tools aren’t always necessary to be successful. Seattle Greenlaker: Thank you, Ben! 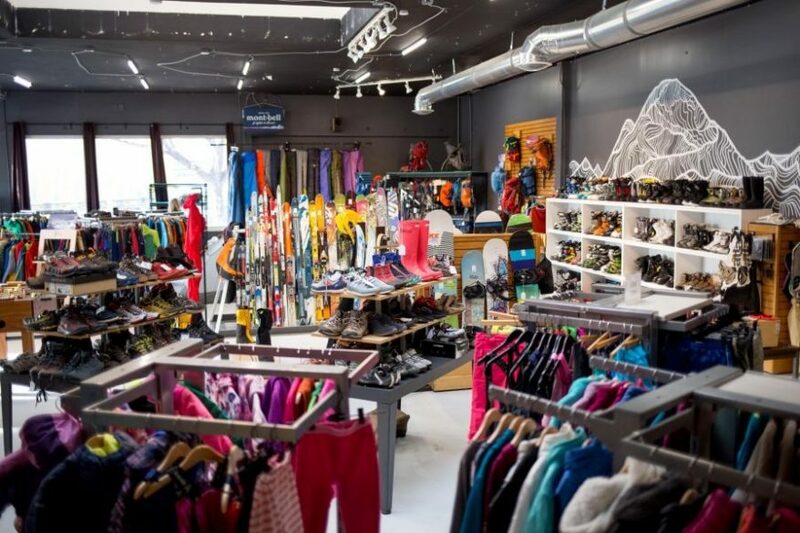 Wonderland Gear Exchange recently had a soft open but will be hosting a Grand Opening Celebration on Dec 8th from 11 a.m. – 3 p.m. with food, drinks, giveaways and samples.